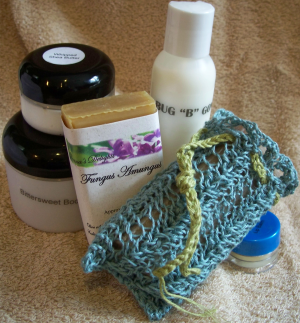 No, this soap doesn't give you fungus, it takes it away! Each bar is loaded with 20% Neem oil. Neem oil is this amazing oil that is an anti-bacterial, anti-viral, anti-fungal, antiseptic and anti-parasitic. What does this all mean you ask. Well if you or a loved one has eczema, psoriasis, ringworm, scabies, athletes foot, cracked heals, chicken pox, poison ivy, lice or dandruff you will want to give this a try. The soap is very gentle to your skin while it cleans. 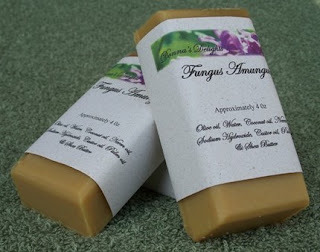 This is an especially good soap for sensitive skin. I personally have washed with this soap after pulling poisen ivy with my bare hands. Now for some people this may not be a big deal, but for me I was taking a huge chance. I came in, lathered up, let it sit for a minute or two and then rinsed. The next day I woke up worry free. Now if you do happen to catch poison ivy all you need to do is lather up, let it sit for a few minutes then rinse and you will find that the itch and burn will stop and by the next day you will have a noticable reduction of your reaction. As great as this soap is on humans, boy will you love what it does for your pets. It will kill the fleas and help clear up their skin conditions as well. Of course their fur will be soft and shiny. There are no other scents added to this soap. It gets it's smell from the neem oil. I think it has the smell of raw peanuts but you can judge for yourself. Once dry the smell will not follow you. Remember Flu season is around the corner! If you want a larger quantity please contact me for more information.